It might be Global Medic’s quick-draw approach to disaster response that has led some to brand them as cowboys in the aid world. It could also be the piss and vinegar commitment its executive director Rahul Singh brings to wringing the most from every dollar, but either way Singh doesn’t much care what others think; he just wants to get in and get out and get the job done — as fast as is humanly possible. 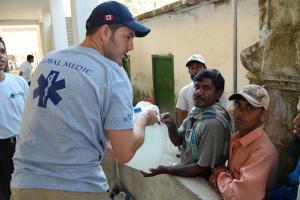 Based in the Greater Toronto Area, Global Medic utilizes a network of volunteer first responders (predominantly police, fire and EMS workers) prepared to depart at the drop of a hat and provide essential lifesaving resources and emergency medical care in disaster zones around the world. When Global Medic shows up, theirs are almost always among the first sets of boots on the ground, bringing desperately needed drinking water and emergency medical aid to victims of natural disasters. A Global Medic rapid response team was on the ground in Port-au-Prince setting up inflatable hospitals, dispensing clean water and handing out water purification tablets within 72 hours of the massive earthquake that struck Haiti this past January. If the trip hadn’t required transport through the Dominican Republic they would’ve been in the country and operational within 48 hours. Get in quickly, stabilize the situation, and get out of the way to let agencies that specialize in long-term relief and rebuilding take over is Global Medic’s modus operandi in responding to all types of natural disasters, from deadly earthquakes in China, Pakistan and, most recently, Chile, to flooding in Sudan, hurricanes in the Dominican Republic, and the tsunami that struck the Solomon Islands. As first responders, they know what they’re good at: delivering immediate, lifesaving assistance, so that’s where Global Medic concentrates its disaster relief efforts as well. That specialized training fills a necessary niche in disaster response protocol. “We certainly consider ourselves innovators in disaster response technologies and techniques,” says Singh, the Toronto paramedic who founded the organization and has become its public face. “We’re very different than any other agency out there. Every other agency comes in with a clipboard [to do assessments before sending aid]. We don’t come in with a clipboard; we come in with a solution right away — and then we add to that solution. “For example, if you have 1000 people taking shelter in a church after a hurricane or an earthquake, we’ll come in and install a formal water system and train you how to use it. We’ll give you water purification tablets. This is the first time we meet you. We’ll come in, look at what you’ve got, figure out what’s going on and apply a solution. Right then and there we’ve resolved the problem to an extent,” he says. If you hadn’t already guessed, Singh isn’t one to go along to get along. He’s got convictions and he wears them unrepentantly on his sleeve. A bear of a man with an outsized personality, he is polite and engaging but unapologetic in his quest to reform the way in which disaster response methodologies are implemented. Singh firmly believes Global Medic’s solutions, which focus on satisfying the immediate needs of potable water and medical care in the first days following a disaster, fill that initial gap when people are most vulnerable. “The government needs to wake up and understand that its current methodology and distribution systems don’t work for the emergency initial phase. I’m talking about the first 48 to 72 hours. Singh, just back from Haiti, is exhausted and understandably a bit raw. “To be honest with you, I had an 8-day old baby die in my arms the third day there,” he says quietly. Talk of training and hiring Haitian teenagers to run the water purification systems Global Medic set up in Port-au-Prince neighbourhoods calms his mood a bit; it’s obvious he takes as much pride in local empowerment as he does in disaster relief. He points out that by training locals to operate the water purification systems Global Medic brings in on first deployment, and leaving the units behind on departure, to be used for as long as necessary (and stored for immediate use in future disasters), Global Medic encourages locals to participate in securing their own short- and long-term solutions. Its invaluable temporary water infrastructure, much like its inflatable hospitals, which can be operational in a matter of hours, is key in stabilizing disaster situations to allow relief and development agencies to take over. 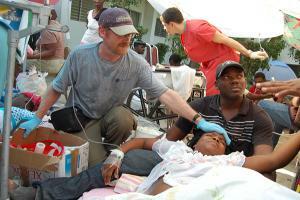 Even two months in to the Haitian disaster the need for Global Medic’s expertise remains acute. 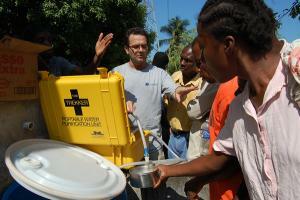 Since its original deployment in mid-January the organization has provided more than 10 million litres of potable water for Haitian earthquake survivors (an average of 150,000 litres per day) but is unable to expand its capacity on the ground because its first three proposals to the Canadian government’s donation matching program have all been rejected. As fired up as Singh gets when talking about the mechanics and politics of disaster relief, it isn’t the organization’s only focus. Global Medic also undertakes one-off capacity building missions in areas where it can make a meaningful impact in developing nations; training first responders, delivering medical supplies, building clinics and schools, and providing emergency medical training to medics working with land mine removal teams through the United Nations’ Mine Action Office (UNMAO). Over and above its land mine medic training program, Global Medic has also developed an emergency medical care training package for hospitals and health care workers across the globe. Delivery of these programs is supplemented with donations of supplies and equipment and the receivers are trained in their use and maintenance. Global Medic is actually the brand by which the David McAntony Gibson Foundation is better known. Started by Singh in 1998 in tribute to his best friend, shortly after his death following a rejected liver transplant, DMGF strives to honour Gibson’s compassion and commitment to community building through Global Medic’s work. “[But having] DMGF on our t-shirt in the middle of Port-au-Prince or wherever, with people dying, needing water and needing hospitals, it isn’t a cool name and people aren’t going to understand what you do,” says Singh. “Global Medic is a very cool name. You understand. It doesn’t matter what country you are from (you get) Global Medic.” Rather than change the foundation’s name, Global Medic has instead become the moniker of its operational arm for disaster response and capacity building work. 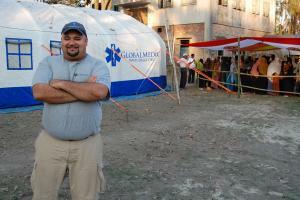 As good at disaster response as Global Medic has become in the ensuing years, Singh acknowledges that the organization doesn’t put as much effort into raising money as it could. “We’re an agency that executes as opposed to one that sits there and tries to raise money, which is to our downfall in some respects. If you look at the big agencies of the world today some are incredible at raising money but lousy at spending it efficiently and others, like us, are great at getting the job done cheaply and efficiently, with use of local resources, but we’re lousy at raising money. Lousy,” he laughs. Without much attention to fundraising, Global Medic still raised over $300,000 in financial contributions last year and took in millions more in donations of medical equipment and supplies, medicines, water purification equipment and tablets, and other disaster zone necessities. They also benefit from strong relationships with airlines who contribute shipping space for equipment when a team departs. Overhead is kept to a minimum; 100 per cent of all financial donations go directly to program funding. 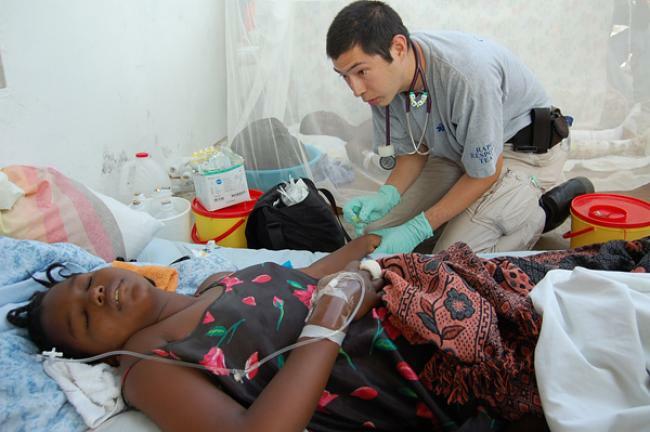 Relying mostly on volunteers, Global Medic employs two full-time staff paid with money earned by providing programs via organizations like the UN rather than taken from the charity’s financial donations. Even its warehouse/office space is donated, as were most of its furnishings. He runs a tight ship, but Singh is absolutely committed to frugality at home in order to deliver as much aid as possible to those who most need it. “We bring money in to send it out. We don’t hoard it or save it or what have you. The building’s donated, everything’s donated,” Singh says, indicating around its upper level lounge/lunchroom/boardroom.